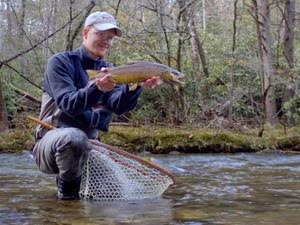 One benefit of the Tennessee tailwaters is that they normally contain more than just trout and char species. In fact, many Tennessee tailwaters are not trout streams but that is not my point. On any given day, you can fish a river in Tennessee and have a good shot at catching rainbow, brown, and brook trout, as well chances at smallmouth, largemouth, bluegill and other sunfish, carp, walleye, stripers, white bass, hybrids, yellow bass, musky.....I hope you begin to see my point. There are many possibilities when it comes to fishing here in Tennessee. 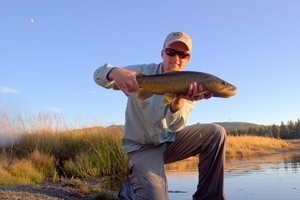 On a recent float with David Perry, we came across a lot of nice fish that included but was not limited to trout. The white bass were another story. We found them stacked up in similar water as the carp, just a little closer to the current. White bass are nice when the fishing is slow, but can get frustrating when they are running because they are almost too easy to catch. Later, we got onto some more trout. Both of us caught some nice rainbows and we started noticing a little hatch coming off. Light colored bugs were flying around. It appeared that both Light Cahill's and Sulphurs were hatching and the fish were pretty excited. 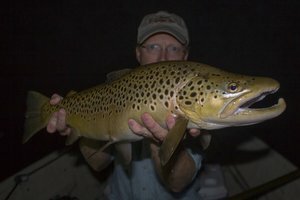 We are early enough in the hatch that nymphs will still produce more strikes than the dries will. After David P. had caught more than his share of rainbows, I moved to the front of the boat. Not far down the river, I cast to a favorite log. Sure enough, the indicator dove under. I lifted the rod tip expecting another 14" rainbow. 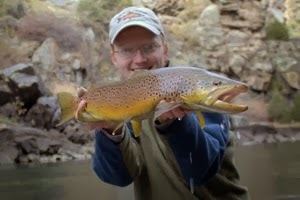 A swirl of golden brown on the other end hinted at my favorite, an elusive brown trout. As I fought the fish, I thought it was about 14". However, as the fight continued, that estimate kept going up. When we landed the fish, it was definitely larger than 14"! After the necessary pictures, the beautiful male swam away, hopefully to grow a few more inches before I catch him again. As I turned to look around me and enjoy the moment, the sun broke through the clouds and lit up my surroundings with that rich evening light. Out came the camera. The bugs were still hatching and I took pictures of them as well. Catching big fish usually lands the angler at the rower's bench. I climbed into the boat and started guiding David P. down the river again. The bluegill got active and we added another species to the list for the day. The sun was casting its rays across the sky, and I let the boat slowly spin in circles as I clicked away with the camera. Diverse? I'll say. Nice pictures. 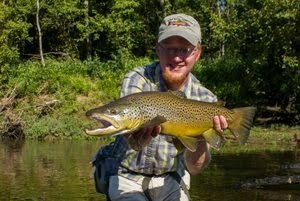 I could use a brown like that one.